The MTSs is designed for use with Ss Brewtech’s Infusion Mash Tun. During extended Mash periods or in relatively cold ambient temperatures, the mash will naturally drop in temperature. With the MTSs you will be able to provide better controlled temperatures during the mash scarification process. Holding a consistent scarification temperature will insure you are making the beer and flavor profiles you planned to produce. 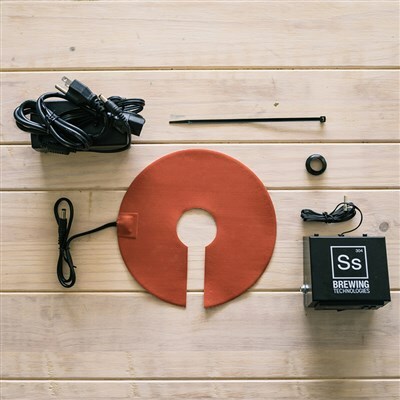 The MTSs is a low wattage silicone heater pad, which is bonded to the underside of the 5 degree sloped bottom on your Mash Tun using a strong adhesive backing on the heater pad. The heater is controlled with a 12 volt digital temp controller. You simply set your target temperature and the heater will cycle on and of to maintain your set point. This system is NOT designed for heating water to strike temp and/or step mashing, though it can help with fine tuning your strike water temp those last few degrees and/or maintaining your strike water temp while you are preparing your grist or balancing your water chemistry.